Das absolut Beste des amerikanischen Westens: Lass dich begeistern vom Naturwunder Grand Canyon und erforsche die imposanten Granitfelsen, Wasserfälle und Mammutbäume im außergewöhnlichen Yosemite Nationalpark. Die schluchtenreiche Landschaft im Zion Nationalpark wird dich ebenso begeistern wie die bizarren und farbenprächtigen Felsformationen im Bryce Canyon Nationalpark und die atemberaubenden Steinbögen des Arches Nationalparks. Eine fantastische Kulisse aus Tafelbergen erwartet dich im weltberühmten Monument Valley, wo du in die Kultur der Navajo eintauchen und die fantastische Kulisse erleben kannst. 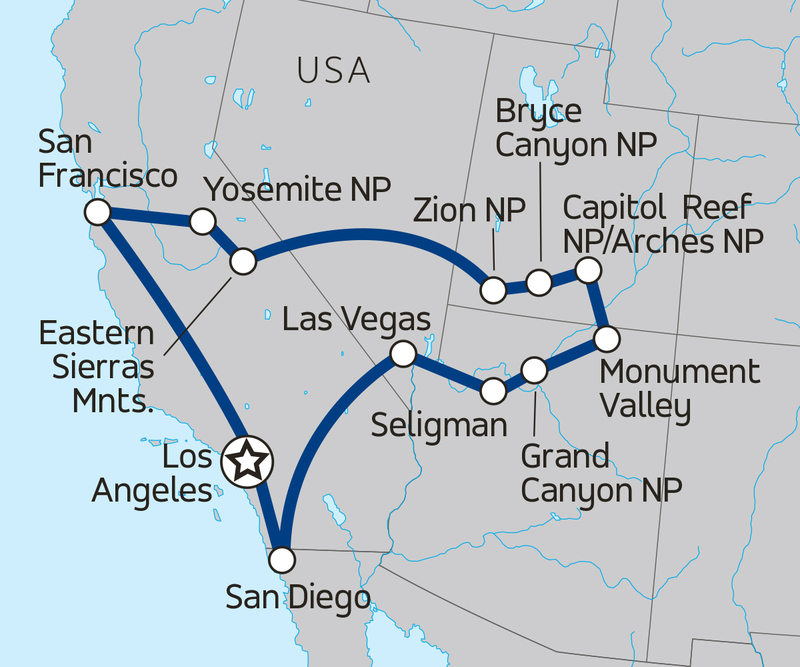 Entdecke die Attraktionen im energiegeladenen Las Vegas und tauch ein in den unvergleichlichen Charme von San Francisco, ehe deine Erlebnisreise durch den Westen der USA im pulsierenden Los Angeles endet. Die Unterbringung erfolgt in geräumigen Zwei-Personen-Zelten. Alleinreisende werden zusammen mit einem/r Mitreisenden gleichen Geschlechts untergebracht. Während der Hotel- und Hostelübernachtungen übernachtet Ihr in Doppel- oder Mehrbettzimmern. Die Buchung eines Einzelzimmers ist bei dieser Tour nicht möglich. Jeder Teilnehmer zahlt pro Tag USD10 in die gemeinsame Essenskasse ein. Hiervon werden die Lebensmittel gekauft. Das Food Kitty wird genutzt, um die Mahlzeiten während der Campingtage abzudecken. An den Tagen, an denen in Hotels übernachtet wird oder Ihr mit der Gruppe ausgeht (z.B. ins Restaurant), werden die Mahlzeiten nicht vom Food Kitty abgedeckt und müssen separat bezahlt werden. Das Hotel "Fairfield Inn Marriott" bietet einen kostenfreien Flughafenshuttle ab/bis Los Angeles International Airport an. Departing ‘The City of Angels’ you'll travel up the sparkling Californian coastline towards Santa Barbara and enjoy some time exploring the pier and shops, or relaxing on the beach. Known as 'The American Riviera', you'll find no shortage of palm trees to sit beneath. Continue onto San Luis Obispo where a night under the Californian stars and chance to swim in the Pacific Ocean will be just the thing to finish the perfect day. This morning you continue onto the ‘City by the Bay’, San Francisco. Soak up the hippy vibes in Haight-Ashbury on a tour with your leader, followed by a walk across the engineering wonder that is Golden Gate Bridge! For the ultimate view, we recommend you set sail on an optional sunset sailboat cruise that will take you right under the bridge. We include a ferry across to infamous Alcatraz Prison for a tour (value US$33). In your free time, jump aboard one of the city's cable cars to explore further, make sure you swing by the famous 'Painted Ladies', visit Fisherman's Wharf for some delicious seafood and spy some resident sea lions at Pier 39, before finishing off in North Beach for the nightlife. Prepare to be wowed as you witness thundering waterfalls, granite peaks and towering Giant Sequoia trees in stunning Yosemite National Park. Amazing scenery lies around every corner as well as an abundance of wildlife. Look out for bears, coyotes and other wildlife that calls the park home. To be part of the action why not take a float trip on the Merced River or hike the Mist Trail to Vernal Falls for jaw-dropping views every step of the way? Make the most of this remote location as you leave lush Yosemite National Park behind for a night in the heart of the Eastern Sierra Mountains. Visit Rachel in Nevada, the closest town to the former secret US Air Force site known as Area 51 and a very popular destination with UFO hunters! Make a stop at Little A'Le Inn Bar for close encounters of the alien kind. Head to Zion National Park and for unbelievable 360 degree views, hike colourful canyons up to Angels Landing. The hike itself will leave you breathless in more ways than one! If you prefer to take the low road, lace up your boots and prepare to get wet as you wade through the magnificent Narrows, deep-cut canyons between cathedral-like sandstone walls that have been carved out by the Virgin River. Whether you're up top or down below, you'll get a real sense of how unique and beautiful this place is and Zion will blow your mind! If you want awesome rock formations to gawk at then you're definitely in the right place! You're in Bryce Canyon National Park, famed for its hoodoos - weird and wonderful knobbly rock spires arranged in rows. ‘Mysterious’, ‘breathtaking’ and ‘out of this world’ are a few of the descriptions offered by past visitors to Bryce Canyon National Park. Native Americans believe these crazy shapes to be ‘Legend People’ who were turned to stone for their sins, but we'll let you decide. For close up views, take advantage of the park's incredible system of trails. Wherever you walk, you will encounter a kaleidoscope of colours and a fantasy land of wonderful hiking trails. In the heart of red rock country, Capitol Reef National Park is packed full of cliffs, petroglyphs, canyons and domes and you've only got Mother Nature to thank for that. From one incredible place to the next, you're in Utah's undisputed adventure capital, which guarantees non-stop fun for everyone! With two days at Arches National Park you'll have plenty of time to explore some of the 2,000 gravity defying sandstone arches. Take a sunset stroll and watch as the sun sets over Delicate Arch or, for the action lovers, hire a mountain bike for some adrenaline pumping cycling along Moab's slick rock path or take an off-road Hummer tour. For the ultimate adventure head down the Colorado River on an optional float trip and see this stunning place from a different perspective. Immerse yourself in native culture on an included Navajo guided jeep tour of the Navajo Reservation and backroads of Monument Valley. Experience the home of the real ‘Wild West’ as you stand in front of one of the most iconic landscapes of the desert Southwest and marvel at the sight of towering buttes and mesas. You won't find a better location to swap campfire stories than under a blanket of stars. It's time for the main event, the mighty Grand Canyon! Nothing you've ever seen before will prepare you for this spectacular sight. Hike from the forest above to the desert below, or take an optional helicopter flight above it all and marvel at the brilliant colours. To capture the Grand Canyon in all its glory, wait for sunset or sunrise when the colours really will amaze! We recommend a hike on the Bright Angel Trail down to Plateau Point for views of the Colorado River and soaring condors. This is definitely one for your 'natural wonders of the world' tick list. Today will define the word ‘road trip’ as you cruise down the original Route 66! You'll stop off at the iconic sights such as the town of Seligman which sits frozen in time and has tons of shops full of Americana memorabilia. But then it's time for Vegas, baby! Nowhere on earth is quite like it. Why not treat yourself to a high-rolling party bus ride, indulge in an all-you-can-eat buffet, take in a show or just watch the amazing crowds and neon signs as the glitzy hotels try to outdo each other with spectacular attractions? And if that's not enough, you could take an optional helicopter flight down The Strip. Just remember, 'what happens in Vegas, stays in Vegas'. From one extreme to the other, you leave the Vegas’ crazy party scene in favour of a more relaxed time chilling out on one of California's awesome beaches, perfect for nursing those sore heads. San Diego is all about bronzed bodies, big shades and board shorts! With your trip almost at an end, it's time to make sure you head home with an awesome Californian tan, so head to Mission Beach, one of the best beaches on the West Coast. Later, check out the Gaslamp Quarter at the heart of San Diego's nightlife, and soak up a blazing Californian sunset as the sun goes down on what’s been an awesome day. As your 20 day adventure draws to an end make the most of a few extra hours on the white sandy beaches of the Californian Coast with some free time in San Diego. Before you know it you'll be heading back to Tinseltown and what better way to finish up than with a visit to Venice Beach and a stroll along the boardwalk to watch as street performers and skateboarders pass you by. From here you'll make your way back to the hotel where the credits roll on your awesome blockbuster adventure. Unsere einheimischen Reiseleiter werden dich mit ihrem kenntnisreichen und lebenslustigen Wesen umhauen und dir mit all ihrer Leidenschaft das wahre Amerika zeigen. Es werden nur die enthusiastischsten und engagiertesten Leute als Reiseleiter ausgewählt, die - bevor sie mit einer Gruppe unterwegs sind - ein professionelles Ausbildungsprogramm absolviert und ausreichend Erfahrung gesammelt haben. Eine großartige Reise hängt vor allem von einem großartigen Reiseleiter ab! Der Trekleiter ist ein Spezialist für Aktiv- und Erlebnisreisen, fährt den Touring-Van, organisiert unterwegs den Reiseablauf und die Aktivitäten, und steht dir als Ansprechpartner mit Rat und Tat zur Seite. So kannst du deine Reise entspannt und stressfrei genießen und bist sicher unterwegs.